First Line: Rain rat-tatted on the plastic hood of her slicker. When a woman killed in Central Park is mistakenly identified as NYPD Sergeant Kathy Mallory, her superiors have a good reason for finding her and bringing her back from suspension. After having identified the victim, Mallory learns that her main suspects all live in the same apartment building, so she moves in and sets herself up as bait. Using her genius with a computer and the building's electronic bulletin board, she begins playing a deadly game of cat-and-mouse. If you're the type of reader who prefers likable, touchy feely main characters, move away from this book (and the entire series). Kathy Mallory is not the character for you. Found living on the streets as a young child, she was taken in and raised by a police officer and his wife, both of whom soon realized that Mallory's sociopathic tendencies required special handling. Mallory does not form relationships like normal people. She doesn't bond; she doesn't chit chat; she doesn't smile; and she certainly doesn't laugh. She's like a hand grenade with a loose pin-- Handle With Care. 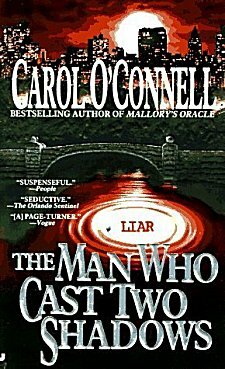 A small portion of her past is revealed in The Man Who Cast Two Shadows, and although readers will be moved to feel compassion towards her, rest assured that Mallory herself will show none to anyone. The plot is tight and suspenseful, dealing with the woman's death, Mallory's toying with a killer, and a boy who may have telekinetic powers. The setting of New York City could be declared one of the cast of characters. O'Connell shows a touch of poetry now and again in her prose, but the tone of her poetry is bleak. More of the story could be told from Mallory's point of view, and there are a few too many times when we're told about her behavior rather than seeing it for ourselves. All in all, Mallory is like a black hole at the very heart of this book, and if you can withstand her gravitational pull and resist the need for her to change, you are in for a treat involving one of the most fascinating characters in crime fiction. Cathy - Kathy Mallory is one of the more interesting characters in crime fiction. She's not, as you say, pleasant, fun company. And yet she's fascinating in her own way. And if anyone could handle an undercover operation like this one, she can. You're correct, Margot. I think one of the reasons why I like her is because she really doesn't give a damn much one way or the other what people think of her or her actions-- only to the degree that they may prevent her from doing what she wants.